It is very important that one wears at least a SPF 30 daily to counteract the UVA/UVB rays that the sun emits during the day. If you use anti-aging products, all of the works that they do will be undone if you are not using a sunscreen to counteract the work of the sun. Here is a perfect product. It is an anti-aging product and sunscreen built into one product. 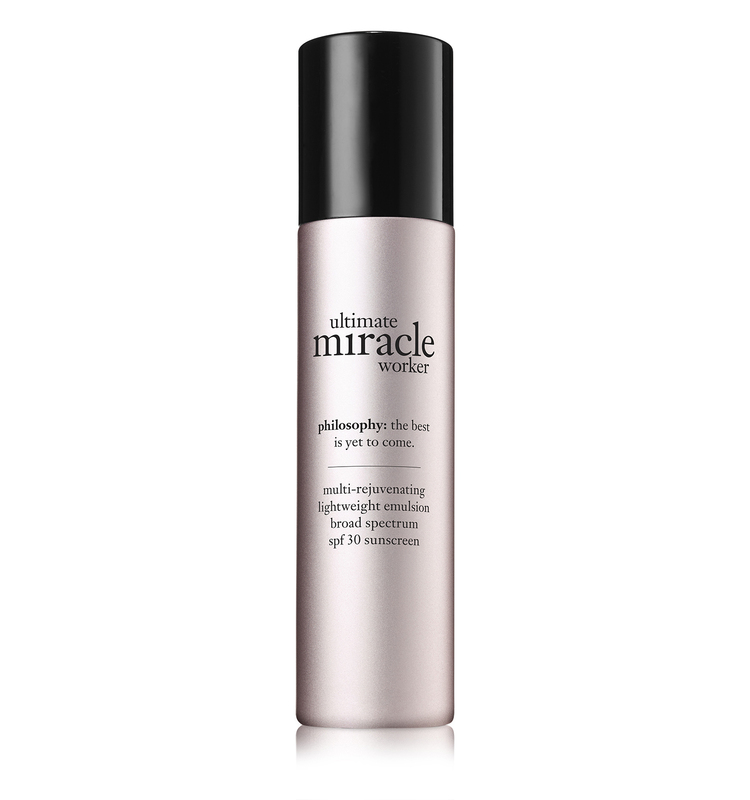 philosophy ultimate miracle worker lightweight multi-rejuvenating emulsion SPF30 works great for anyone with normal, dry to mature skins. To use, apply to clean skin in the morning, before going outside in the sun. This product works well because of the bi-retinoid, which has been shown to work well at rejuvenating skin. Normally you wouldn't see it at a day ingredient but it has been stabilized for this product and it works wonders. It actually helps to decrease hyperpigmentation, increases hydration of skin, softens skin, firms skin, reduces the look of wrinkles and decreases the look of pores. All of this to show you how retinol can work on your skin during the day too. It is not just for night anymore. But you must wear a sunscreen with it because it can make your skin sensitive to the sun. I found that after about 3 weeks I saw really good results with this product. I noticed that I had decreased pore size, decreased hyperpigmentation, softened skin, hydrated skin, firmed skin and the look of my wrinkles around my mouth had decreased. I'm going to definitely keep using it. philosophy ultimate miracle worker lightweight multi-rejuvenating emulsion SPF30 retails for $75.00 per 1.5 oz (45ml) and can be found online at www.philosophy.com and at www.ulta.com. It can also be found where ever philosophy is sold. Like philosophy on Facebook: https://www.facebook.com/philosophy; Follow philosophy on Twitter: @lovephilosophy; Follow philosophy on Pinterest: https://www.pinterest.com/lovephilosophy/; Follow philosophy on Instagram: https://www.instagram.com/lovephilosophy/ and Subscribe to philosophy on YouTube:https://www.youtube.com/philosophy.